If I’m ever having a junk food craving, it’s usually for something salty. Don’t get me wrong sweet treats are delicious, but in my opinion nothing beats a good bag of chips. My favourite? It’s a tie between ketchup chips (a true Canadian classic) and Dorito’s Sweet Chilli Heat. Though I’d love to eat a whole bag of chips myself, I quite simply can’t undo all the hard work in the gym. 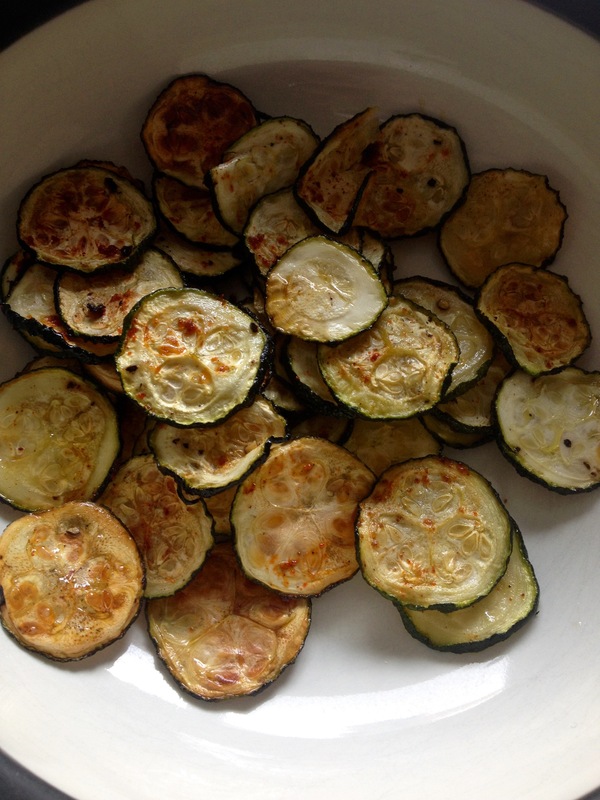 Today’s snack comes from a foodie blog called My San Francisco Kitchen with yummy baked Zucchini chips. This recipe was super easy to whip up. Prep time is about 10 minutes with about an hour to bake. All you do is slice your zucchini and toss in olive oil with spices! The recipe suggests using a mandolin slicer to get the zucchini nice and thin, but since I didn’t have one I just used a tiny but sharp knife, which worked fine. My two small zucchini yielded a small amount of chips. If you are looking to make a big batch, make sure to stock up on the green guys. As for the taste – YUMMY! I loved these. The paprika really added a great spicy kick, which is right up my alley. I thought my chips were getting a bit burnt so I hastily took them out at the 1-hour mark. Unfortunately they were not crispy enough so I think they would have been fine cooking for the extra half hour. Over all these were a great snack and a fun way to add in an extra veggie to your daily intake. Let me know some of your favourite healthy snacks? Double Tap - Follow my Instagram!